The Tallahassee mayor scored a stunning upset in the governor's race Tuesday. Here's what you need to know about him. 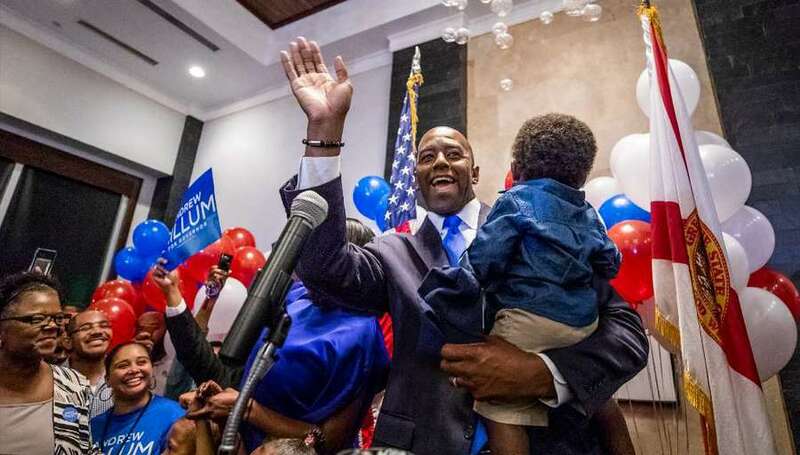 Andrew Gillum scored a stunning upset Tuesday in the Democratic gubernatorial primary. Here's what you need to know to get up to speed on the progressive mayor of Tallahassee. 1. Gillum is young, but politically experienced. Gillum, is young — 39 years old, and married with three young children — but he's been an elected official for over a decade and a half. He was first elected to the Tallahassee City Commission at age 23, just months after he graduated from Florida A&M University. He served over a decade on the commission, spearheading, among other things, an effort to engage local youth in job programs. He also was an early supporter of then-Sen. Barack Obama's campaign for president in 2008. Gillum unsuccessfully ran to be the chair of the Florida Democratic Party in 2010. He was an early backer of Hillary Clinton's 2016 presidential campaign and he has a long history of connections with national progressive groups. 2. Gillum ran a staunchly progressive campaign for governor. Gillum never tried to win over centrist Democrats in his quest for the gubernatorial nomination — defying the general political wisdom in the country's largest purple state. "We don't have to run this campaign as 'Republican Lite' to win," Gillum wrote in a Medium post just a few weeks after entering the race in March 2017. As the race wore on, Gillum's progressive stances on Medicare for All, education spending and the $15 minimum wage won over the left flank of the Democratic Party. Just days before Tuesday's primary, Sen. Bernie Sanders, a hero to many progressives, came to Florida for a pair of rallies with Gillum. 3. Gillum called for Donald Trump's impeachment — nine months ago. Gillum was the only Democrat in the governor's race to call for the impeachment of President Donald Trump. He did so in December 2017, arguing the president's firing of FBI Director James Comey was an attempt to end the investigation into Russian interference in the 2016 elections. "This is an alarming and clear-cut case of obstruction of justice," Gillum said in a Facebook video in December. Of course, Florida's governor has no say in the future of the president. Gillum's strong anti-Trump stance is noteworthy nonetheless. 4. Gillum is about to face major attacks for the first time this cycle. But that doesn't mean there's nothing in Gillum's past that his Republican opponent, U.S. Rep Ron DeSantis, will use. Gillum has been criticized by local partisans for Tallahassee's crime rate and he got into a spat with Gov. Rick Scott over the city's response to Hurricane Hermine in 2016. The attacks got going Wednesday with President Donald Trump tweeting that Gillum is "a failed Socialist Mayor." And then there's the big question hanging over Gillum's campaign. 5. Andrew Gillum's city government is the subject of an FBI investigation — but it's unclear whether he's directly implicated. A close former associate of Gillum's, Adam Corey, has been named in subpoenas in a federal corruption investigation into Tallahassee's government. At issue for Gillum is Corey's attempt to lobby for the expansion of the city's Community Redevelopment Agency, which directs private and public money to revitalization and infrastructure projects. However, Gillum, who as mayor is chair of the CRA, wasn't present for a vote to expand its jurisdiction in 2016. Still, there's a lot we don't know about the sweeping investigation — other than the fact that it hurt Gillum's ability to fundraise in the primary. But Republicans are sure to seize on the open investigation. The Times/Herald's Elizabeth Koh contributed reporting.